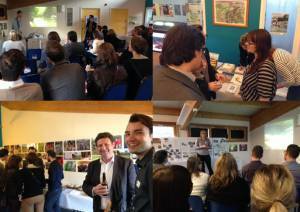 A big thank you to everyone who attended Baca’s Green Sky Thinking event, Treasuring/Taming the Thames, hosted by the Creekside Educational Centre in Deptford. The themes for this year’s Open City Green Sky Thinking Week, Green Infrastructure, Social Sustainability and Intelligent Design, saw a number of interesting topics explained. Richard Coutts and Robert Barker expounded on Baca’s Amphibious House design and the latest designs for further can-float homes currently in the pipeline. The proposed Thames Tideway Tunnel was discussed, and Bettina Kabutz of Creekside described the value of the Centre’s work and the local ecology. Thanks also to RIBA Publishing, who brought along some of their latest titles, along with a preview of the practice’s forthcoming book, Aquatecture. Group discussions on potential solutions to issues of designing with water in cities were very interesting, as were the views on how the next phase of Creekside’s expansion, in development with Baca, should proceed. Thanks again to all, and we look forward to next year’s event.